Rosemary is a common household herb grown in many parts of the world. It is an upright evergreen shrub with long needle like aromatic leaves. 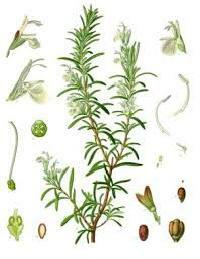 The herb is used for flavoring food, in beverages, as well as in cosmetics. 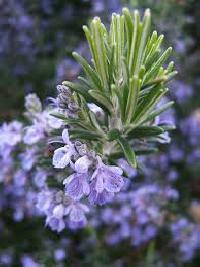 Rosemary is often used to help treat indigestion - Germany's Commission E has approved it for the treatment of dyspepsia. However, it should be noted that there is currently no meaningful scientific evidence to support this claim. 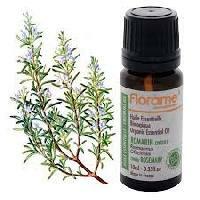 Rosemary has long been believed to have memory enhancing properties. In 1529, an herbal book recommended taking rosemary for "weakness of the brain. Today, research has found that rosemary contains a diterpine called carnosic acid that has neuroprotective properties that researchers believe may protect against Alzheimer's disease as well as the normal memory loss that happens with aging. 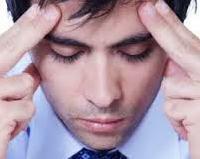 The same study that found that smelling rosemary improved test subjects' quality of memory also found that their mood was significantly improved compared to the control group. Rosemary has powerful antibacterial properties against H. pylori (the bacteria that causes stomach ulcers) and Staph infections.